Lovers of gooey baked goods and Breaking Bad, rejoice. Not only is the AMC drama's prequel, Better Call Saul, finally on the air, but Cinnabon is also celebrating its role in the show by giving away free treats tonight. As the show moves to its regular Monday evening time slot, Cinnabon will be giving out a free "Mini-Bon" to each customer who drops by a location between 5 and 9 p.m. local time. According to USA Today, the free treat will even come in Saul-themed packaging. 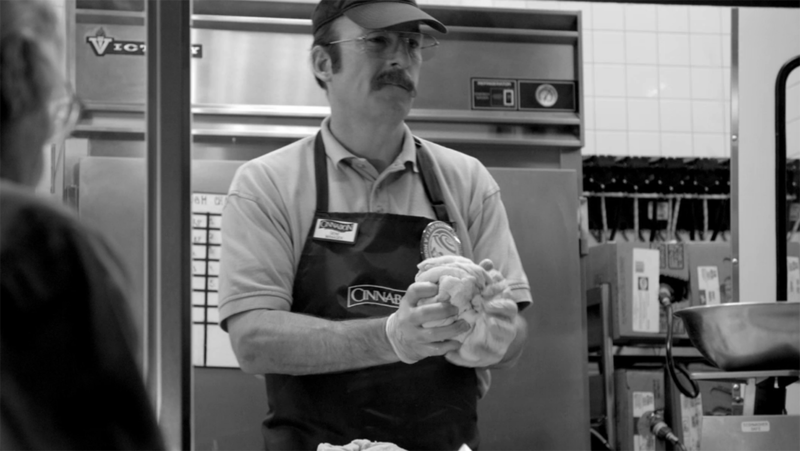 Sunday's series premier of Better Call Saul opened on Bob Odenkirk's character working (as predicted in Breaking Bad's last days) as a Cinnabon manager in Nebraska, where he begins thinking back on his life before getting involved with meth dealing chemistry teacher Walter White. Craving some sweets after last night? Go to @Cinnabon TONIGHT from 5pm-9pm to receive FREE MiniBon before a new #BetterCallSaul at 10|9c! First Undercover Boss, now #BetterCallSaul – it's official, our buns are more famous than @KimKardashian's. The deal is part of a larger campaign between the show and Cinnabon, a partnership that began when the chain was first mentioned on the penultimate episode of Breaking Bad with Saul Goodman's line, "If I'm lucky in a month from now, best-case scenario, I'm managing a Cinnabon in Omaha." Now through March 3, Cinnabon lovers and selfie-takers can also tweet their selfies from Cinnabon locations to #SaulSelfie for a chance to win a year supply of Cinnabon.